If you want to discover art museums in Paris and cute cafes that are off the beaten path, check out our Paris Museums Guide! When planning your visit to Paris, visiting the Louvre and preparing your day at Versailles are some of the most important visits to plan ahead. To help you create the best itinerary for your time in Paris, buying the tickets ahead and prepare for your exploration. We have asked to real Paris’ experts to provide their best tips! We are extremely happy to collaborate with Rebecca Plotnick of Everyday Parisian for this best art museums in Paris top list! Discover her top five art museums in Paris that you must visit once you have seen Mona Lisa! There is a lot more to see in Paris outside of the Louvre. Don’t skip it! But make sure to put these other top five favorites on your list. Read more about our favorite Paris expert and INSIDR ambassador Rebecca at the bottom of the article! A quick peak into the Louvre on my walk to @grandhoteldupalaisroyal it's just around the corner 😉 What's your must visit museum in Paris? The art museum went through a lengthy remodel and finally reopened in October of 2014. I was in Paris and didn’t plan on going on opening day but the lines had died down and I figured why not try. I didn’t wait too long and it was pretty amazing to see on the first day after it being closed for so long. Located in the 9th arrondissement at the foot of Montmartre you will find Musée de la Vie Romantique. I enjoyed an exhibition here last Spring. You can also take tea in the courtyard and enjoy the gardens. INSIDR tips: The charming garden of the Musée de la vie romantique is one of the best spot in Paris for a romantic day! INSIDR tips: Musée Rodin’ garden hosts a lovely outdoor café which is a great spot to have a break at on a busy exploration day! Check out our article of the best movie scenes in Paris featuring Musée Rodin of course! Musée Nissim de Camando was recommended to me for years but I always put it off. I finally went last Spring and I am don’t know what took me so long. I love the history of the art museum and it is off the beaten track but well worth the visit. Stop by Parc Monceau for a stroll before of after. Read Rebecca’s full post about the museum here. I studied French Impressionism in High School so I knew this was a destination for me when I arrived in Paris. I love coming back here time over time to see the impressionist and explore the other parts of the museum. Of course the clock is iconic, it is the image that launched my business. Don’t miss out taking a little time to enjoy the tea room you can get a coffee for the same price as the outside terrace and enjoy the room and the view outside. INSIDR tips: Orsay museum is one of our favorite museum to explore when travelling with kids in Paris. Kids are fascinated with the history of the art museum and its beautiful cafeteria with a special kids menu makes it easy to visit when travelling with kids in Paris. I spent the afternoon keeping warm at the musee d'orsay along with some of my friends Degas, Monet and Cezanne. I stopped to take in the view just as the sun was beginning to set on the city. Musée Jacquemart-André is a private art museum in the 8th arrondissement not far from the Grand Magasins. After shopping, stop by for a cultural afternoon at the museum. You may remember parts of this from the movie, “Gigi” They also have a beautiful tea room and terrace to enjoy afternoon tea. I highly recommend purchasing the Paris Museum Pass if you will be in Paris for a limited amount of time and you can plan your visits. 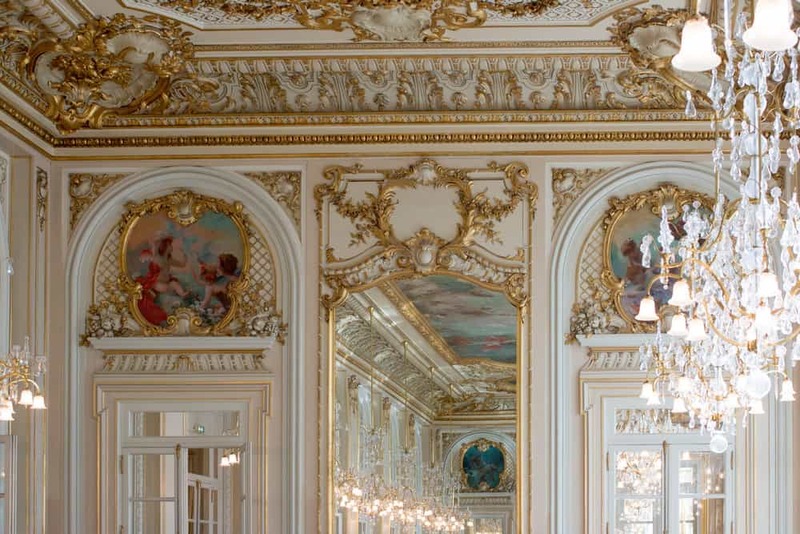 INSIDR tips: We love Jacquemart-Andre museum which is truly like a small Versailles within Paris! For the perfect shopping spree in the area check out our Paris shopping guide! This top article is brought to you by Paris expert – Rebecca Plotnick of Everyday Parisian. Rebecca Plotnick is the founder and creator of Every Day Parisian. In 2013, Rebecca packed up her Chicago apartment and moved to Paris for three months. Three months turned into three years of living a nomadic life between Paris and Chicago. After returning to Chicago, Rebecca missed the Parisian lifestyle and brought the customs and traditions home with her. She started Every Day Parisian to bring a community of Francophiles together and share her love of Paris. On the blog, Rebecca shares her favorite Paris addresses on where to stay, eat, drink, and explore. Not only is the blog informative but as a professional photographer the blog will take you on a visual journey through the City of Lights. Rebecca has been an INSIDR ambassador and we have been following Rebecca’s exploration in Paris for years! We are happy and proud to relay her content today on INSIDR.co.